These cookies remind me of something my mom used to make. As kids, we weren’t allowed a lot of sugary treats. Our lunch bags almost always contained three things: a peanut butter sandwich on whole wheat bread, a can of unsweetened juice, and an apple. Every once in a while there would be a little something extra, but it was always homemade. Mom made three sweet treats: chocolate cupcakes with chocolate frosting so thick you could peel it off and eat it separately like a big fudge sphere, brownies with cream cheese frosting (ditto the thickness), and super thick peanut butter chocolate chip cookies. The sight of any one of those desserts being pulled from our bags had other kids lined up at our side begging to trade. Initially I struggled with trying to come up with a recipe using gluten-free flours, and didn’t have much success. The cookies weren’t awful, but they weren’t great either. 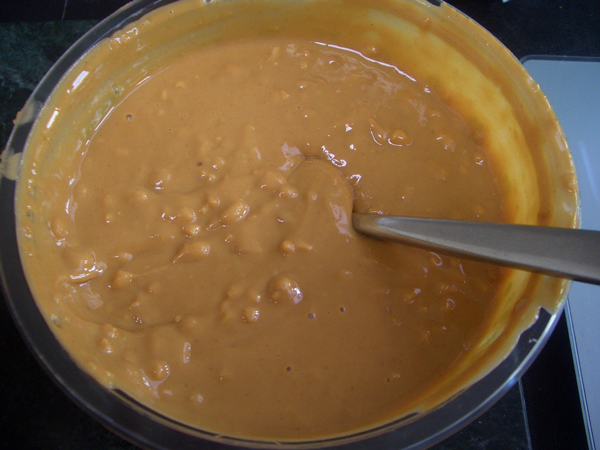 As I sat staring down at the tub of peanut butter I thought, that looks pretty thick on its own, so what if we just kick the flour to the curb. A few online searches later, and I’m reminded of just how illusory originality is… In other words this recipe is everywhere. I’ve taken the basic recipe and added a little vanilla and changed the white sugar to coconut palm sugar. Initially I switched the sugar to pull the glycemic index down a bit, oh but then I added chocolate chips… You don’t have to add the chips. 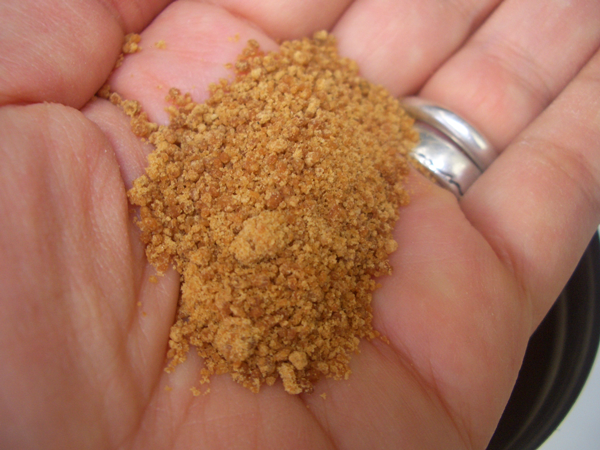 A quick note on coconut palm sugar (see photo below). This is not date palm sugar, which is usually shaped into disks and often used in Asian cooking. Coconut palm sugar is made from the nectar of the coconut flower. It is higher in nutrients than regular sugar. 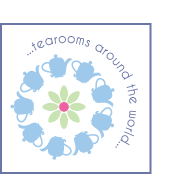 It is one of the ever-so-right-now sweetener trends and should be readily available in most health food stores. Hipper grocery stores would probably carry it. These cookies, like most baked goods made with unconventional ingredients, are a bit tender at first. If you pick them up right out of the oven they will fall apart. You need to let them cool completely. 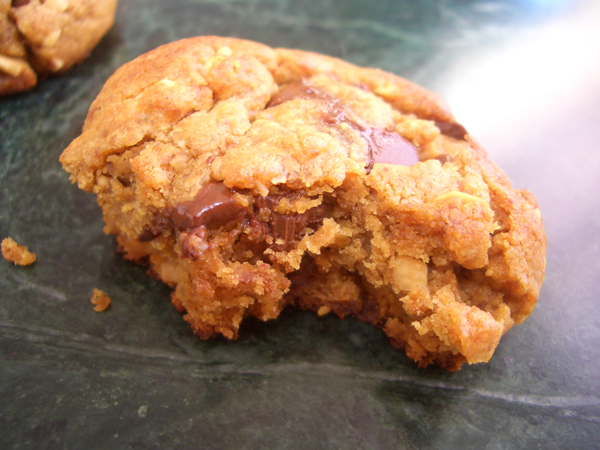 I found they were even better the next day; they were denser and chewier. 1 baking sheet lined with parchment paper. If you want to keep the cookies from getting too brown on the bottom, you can put a cooking rack on top of the baking sheet and the parchment on top of the rack. *I have used regular white sugar with this recipe and have to say I prefer the palm sugar. 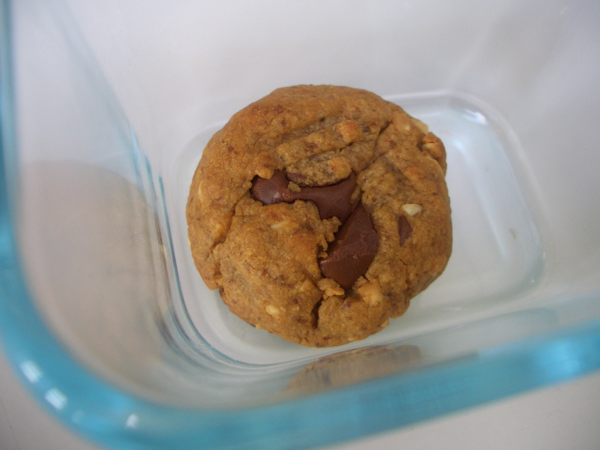 The white sugar stayed very granular and crunchy in the cookies, which I didn’t like. 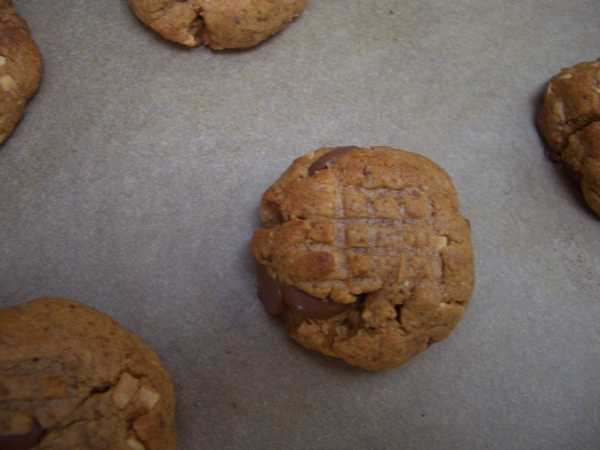 The palm sugar blended and melted better into the peanut butter, but it did make for a darker cookie. Whisk the sugar, baking powder and salt together. 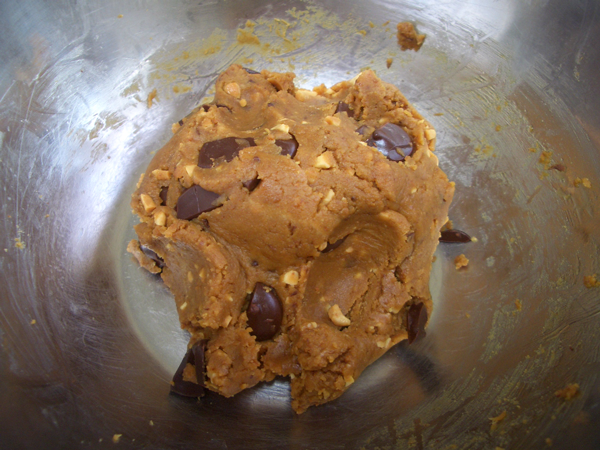 Add the peanut butter and mix to combine. Add the egg and vanilla. Make sure everything is thoroughly mixed together. Add the chips. 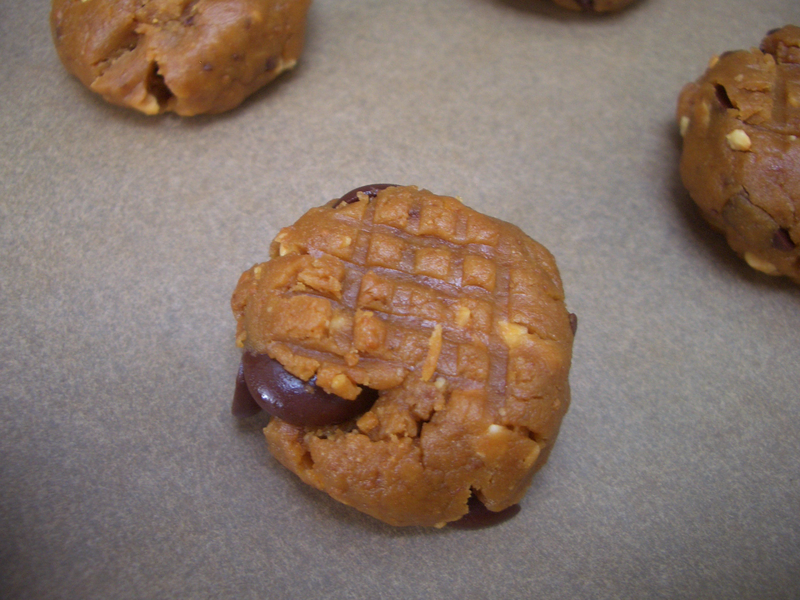 Using about 1-1/2 tablespoons (22.5ml) per cookie, roll the dough into balls and place on the parchment lined baking sheet. 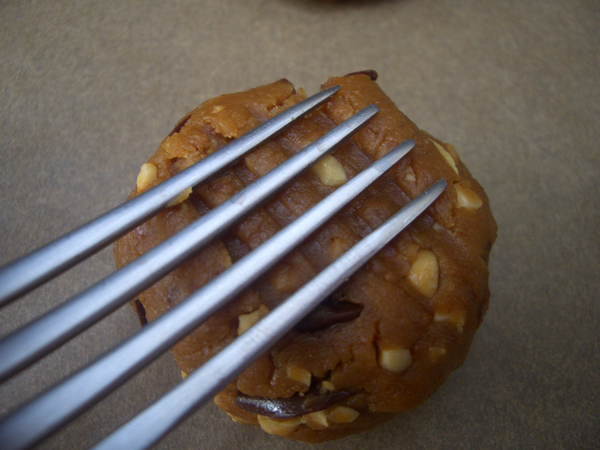 Use a fork to press the dough down a bit and make crisscross marks on the top of each cookie. Bake for about 10 minutes. They should be slightly brown around the edges, but will still be quite soft. Leave them to cool on the tray. They will be too delicate to move. Cool completely before serving. Stored in an airtight container. Oh man I can’t wait to try this, any tips for the baking challenged?